Former prime minister Nawaz Sharif defended the guard responsible for the attack on SAMAA TV cameraman Wajid Ali outside parliament on Monday. 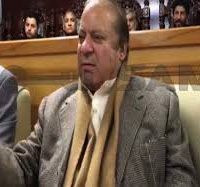 The PML-N Quaid, who was apologetic before, put the entire blame on the cameraman while he spoke to media inside the accountability court chamber on Tuesday. He said that his guard, identified as Shakoor, was in front of him and he was moving people away from him. “I was watching him. He pushed the cameraman. However, he [cameraman] hit Shakoor on the forehead with his camera after which he was injured,” he said. The journalists’ community said that cameramen can never do that as they hold their cameras to be extremely precious. Others pointed out that no one saw the injury on Shakoor’s forehead, adding that there was no medical report either. Interestingly, Nawaz’s statements are in complete contradiction to what he said before. He remarked: “I assure you that such actions will not be held in future.” The PML-N Quaid has taken notice of the attack. “I condemn the attack on Wajid Ali,” he said, adding that he was quite saddened by it. I ordered his treatment when I got to know about it, Nawaz said. “I respect the journalists’ community a lot,” he added. Was Nawaz there or not? Nawaz’s statements have created confusion as to if he were present when the attacked occurred or not. On Monday, PML-N leader Marriyum Aurangzeb remarked that Nawaz was not present when the attack occurred. However, Nawaz portrayed himself to be an eye-witness. She remarked that Nawaz had left parliament when the incident happened, adding that he found out about it later. “Nawaz himself called me and informed me about it.” She said that strict action will be taken against the guard. Punjab Information Minister Fayyazul Hassan Chohan remarked that the country knows about Nawaz’s attitude and behaviour. “His guard took down a cameraman like a wrestler and rather than firing him, Nawaz has jumped in for his defence,” he said. He is stubborn on this issue like he has been on other issues. Railways Minister Sheikh Rasheed said that chief justice should take notice of the attack. He remarked that a case should be registered against Nawaz too. Rasheed was speaking to media outside Pakistan Institute of Medical Sciences in Islamabad. SAMAA TV cameraman Wajid Ali was left unconscious after being attacked by former prime minister Nawaz Sharif’s bodyguards outside parliament on Monday. His condition is said to be stable now. Ali was making footage of Nawaz Sharif while he was leaving parliament. His camera hit the shoulder of Nawaz’s chief security officer by mistake. The enraged security officer ordered his subordinates to “get that boy and teach him a lesson”. The security guards pushed Wajid Ali on the ground and one kicked his skull. The cameraman fell unconscious with blood dripping from his nose and mouth. The disqualified prime minister didn’t notice it and left in his vehicle without his security protocol. The enraged security officer ordered his subordinates to “get that boy and teach him a lesson”. The security guards pushed Wajid Ali on the ground and one kicked his skull. The cameraman fell unconscious with blood dripping from his nose and mouth. A case has been registered against three security guards under sections 355 (assault with intent to dishonour a person) and 506 (criminal intimidation) of the Pakistan Penal Code, 1860. Two security guards have been taken into custody.